The man who foolishly does me wrong, I will return to him the protection of my most ungrudging love; and the more evil comes from him, the more good shall go from me. 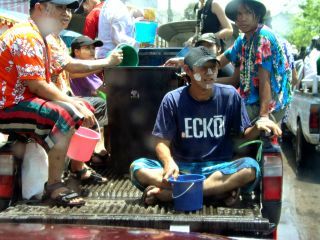 His 'war paint' is talcum mixed to a paste with water and is traditionally spread around on people, vehicles, buildings, dogs cats and sausages during songkran. Bangkok has taken almost four days to remove the worst of the talcum from theur signage etc. this year.